Jupiter's 'Twin' Found: Is This Solar System 2.0? Artist's impression of a Jupiter-size planet orbiting HIP 11915. A planet similar in mass to Jupiter, and orbiting a sunlike star at about the same distance as the real Jupiter, may have been identified by scientists — and the alien solar system may have more planets like our own. The Jupiter doppelgänger, called HIP 11915, was identified by a team of scientists searching for solar systems that resemble our own, according to a statement from the European Space Agency. 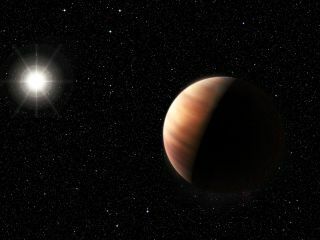 What's more, the composition of the parent star suggests there could be rocky planets closer in, the researchers said. You can see a video explaining the new research here at Space.com. "After two decades of hunting for exoplanets, we are finally beginning to see long-period gas giant planets similar to those in our own solar system," said lead author Megan Bedell, a graduate student in astrophysics at the University of Chicago, in a statement. "This discovery is, in every respect, an exciting sign that other solar systems [like our own] may be out there waiting to be discovered." Extrasolar gas giants are a common find, but what makes HIP 11915 interesting is how far away it is from its parent star. Current methods of planet-hunting – such as detecting the effect on a star – favor finding big planets close to small dwarf stars. According to the release from ESO, this newly discovered system is the "most accurate analogue yet found for the Sun and Jupiter." This find could be a help to predicting where life arises in extrasolar systems, the team added. In our own solar system, the theory goes, the massive size of Jupiter acted as an influence on how the smaller planets around it were arranged. Since at least one of those planets (Earth) hosts life, Jupiter could be considered a life-friendly asset to our solar system. However, Jupiter is also believed to have directed many comets and asteroids toward the sun early in the solar system's formation, which could have upped the chances for cosmic smashups a few billion years ago. The discovery of HIP 11915 was made with HARPS, a planet-hunting instrument on the European Southern Observatory's 3.6-meter telescope at La Silla Observatory in Chile. Scientists said follow-up observations will be necessary to confirm the find. The research will be published in the journal Astronomy and Astrophysics.